Since I’ve started working on the farm I get a lot of people asking me questions. 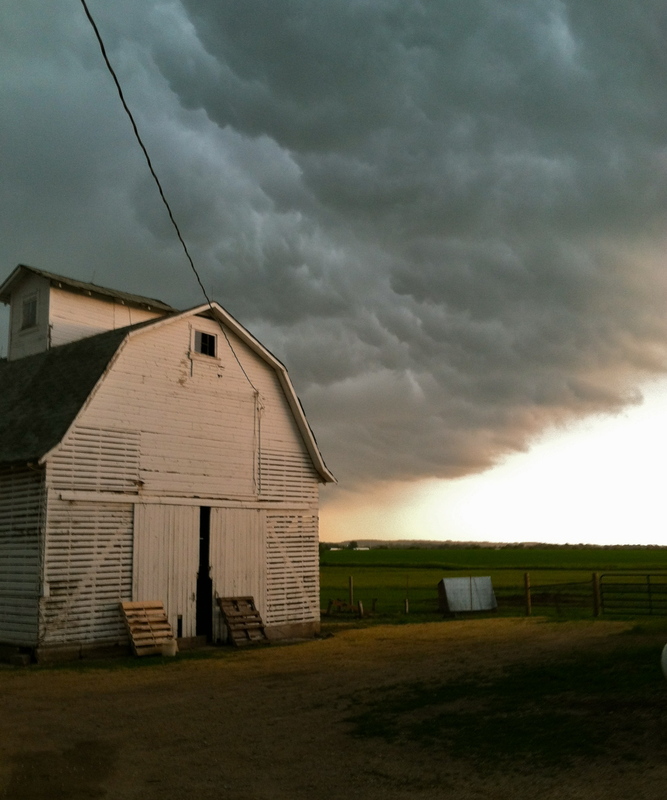 What is the farm like? What kind of farm is it? What do you do every day? 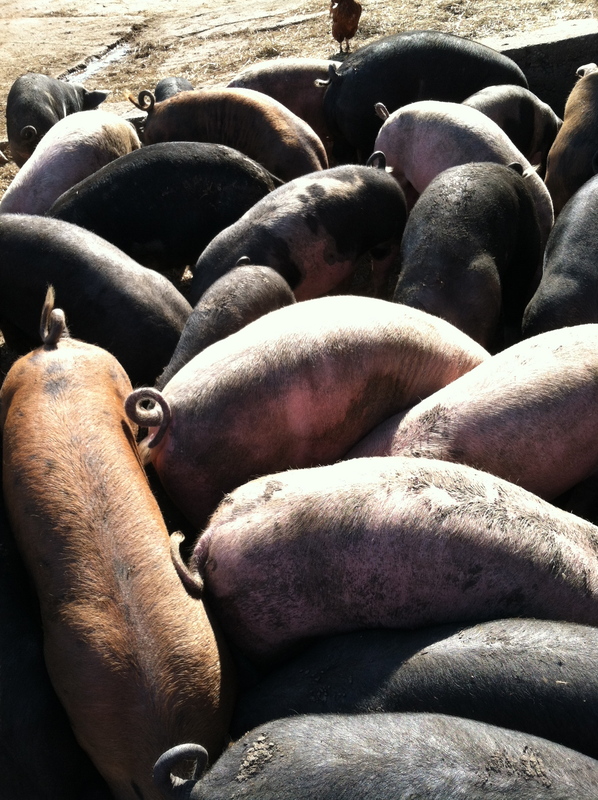 Well, for starters, I work for a small, family farm that raises hogs, sheep, cows, and chickens. 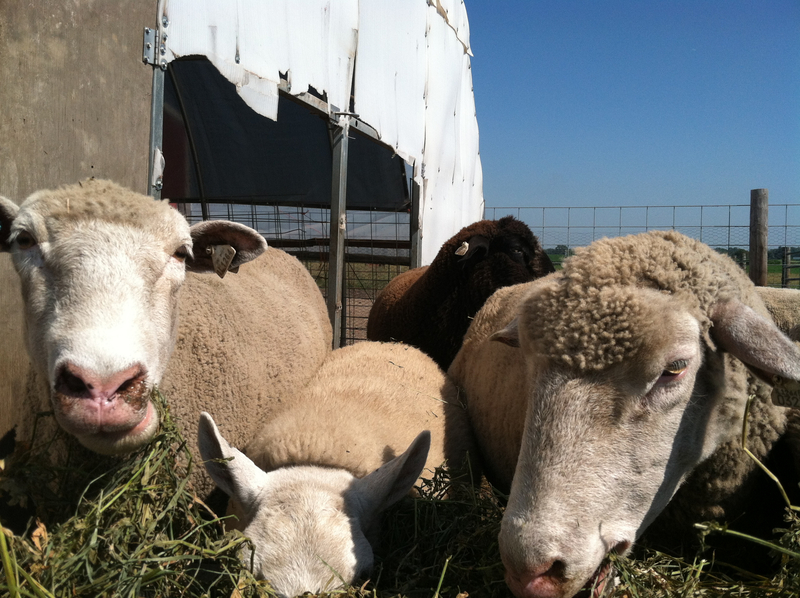 The animals are all pasture-raised, and are never given any antibiotics or hormones. 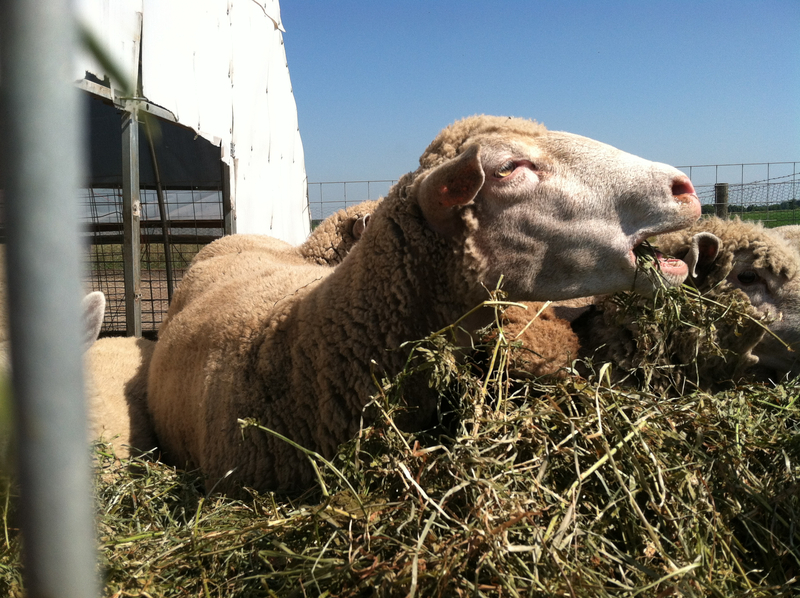 The farm is not certified organic, but they are Animal Welfare Approved. (I think I’ll wait for another post to discuss label meanings and the various certifications). 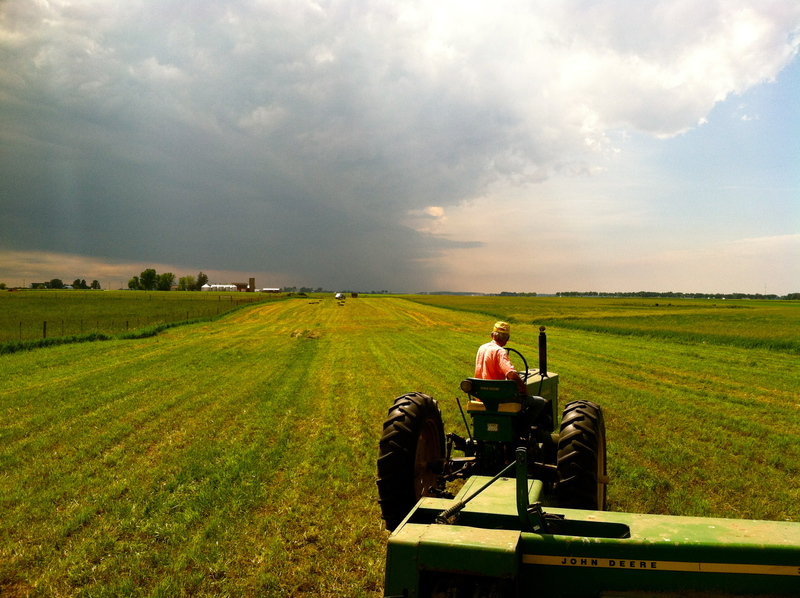 This year the farmer hired three interns — myself, my husband Ric, and another intern who is interested in having a farm with his family one day. 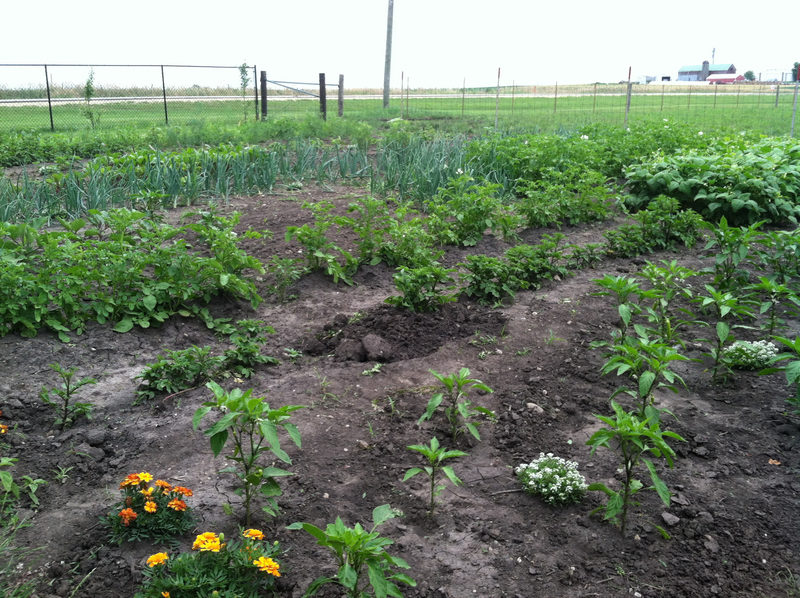 One of our intern projects has been planting and maintaining several gardens, which has been a great learning experience for us. I’ve always loved the idea of growing things, but I have a bad track record… I can’t even keep house plants alive. It’s been good for me learning how to plant, when to plant, and how to care for the plants to hopefully save them/protect them from the myriad of issues they’re up against when growing organically — weeds, bugs, mildew, disease, etc., etc., etc. 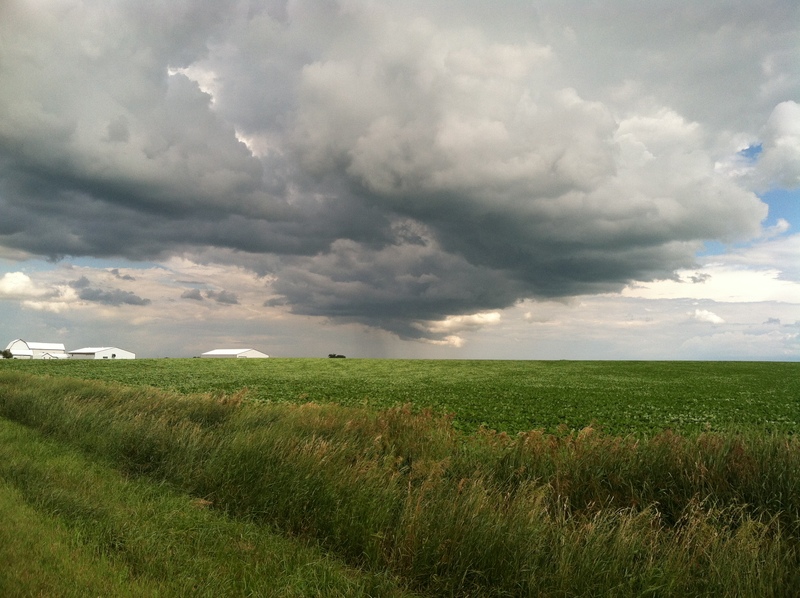 So, here is an attempt to answer questions and share with you what life on the farm is like. (And also share lots of fun pictures). I get to the farm around 8:30 in the morning and usually head to the garden. It’s been sweltering hot lately but it’s beautiful in the garden in the mornings. It’s warm but not too hot yet, and the garden is in shade. We spend time weeding or harvesting or planting Some days I’m with Ric and/or the other intern and some days I’m on my own. I like it when I’m alone and feel like I can really soak all the beauty in. 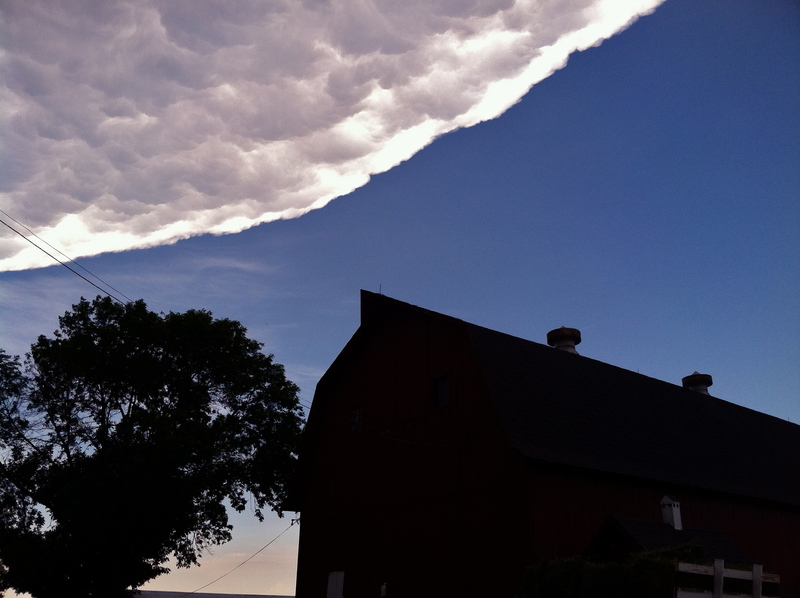 The sky lately has been blue blue blue, and if you look out past the farm, most of what you see is sky. All around is sky and land. Blue and green, everywhere. The sky always gets my attention, because it is always so beautiful. I can’t help but stare. The only sounds in the mornings are the chickens in the hen house and the birds singing. 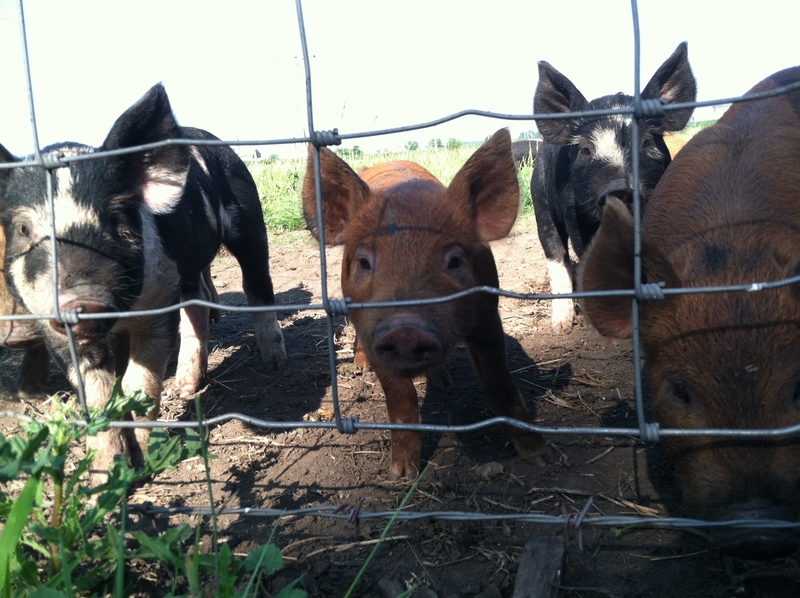 And sometimes the pigs keep me company… I hear them, the babies and their mamas, just a few feet away, snuffling and rooting around in the grass. 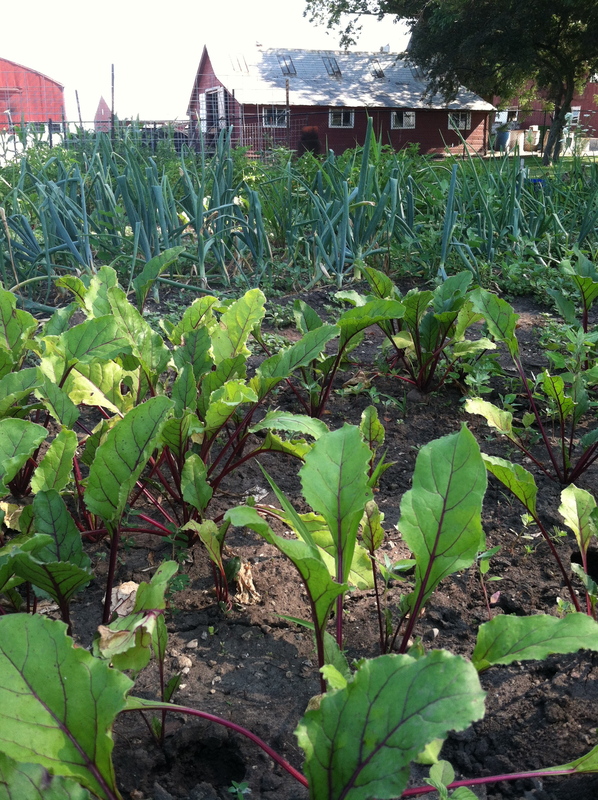 Beets, etc., with the hen house in the background. 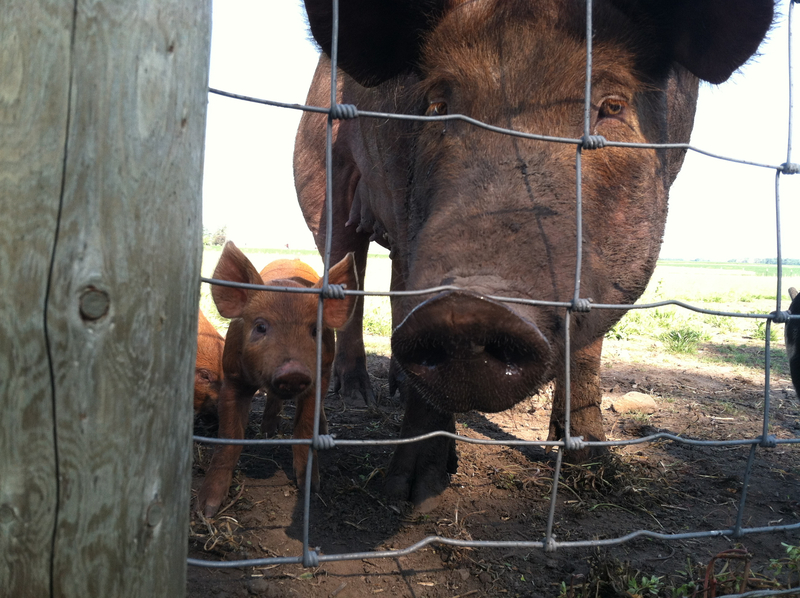 Curious piglet and his mama, who might try to kill me for getting too close to her babies if not for this fence. 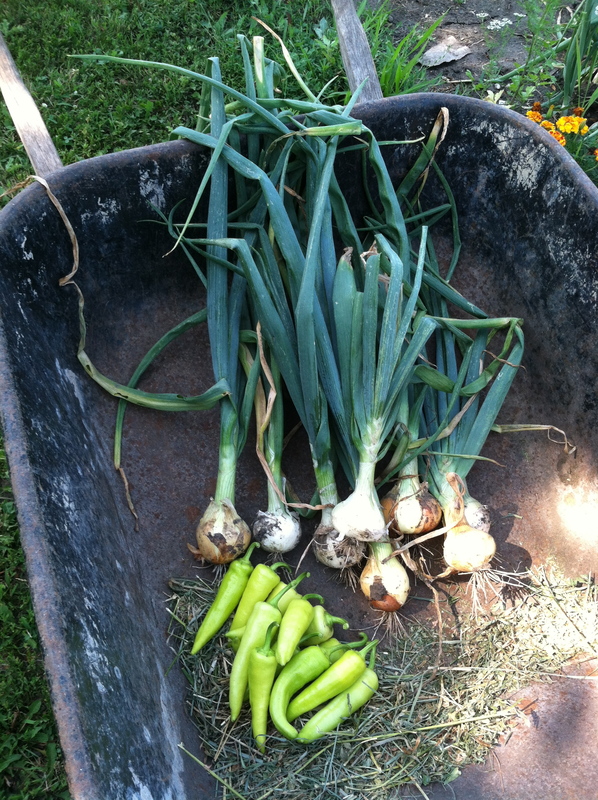 Lately we have been getting so much out of the garden. 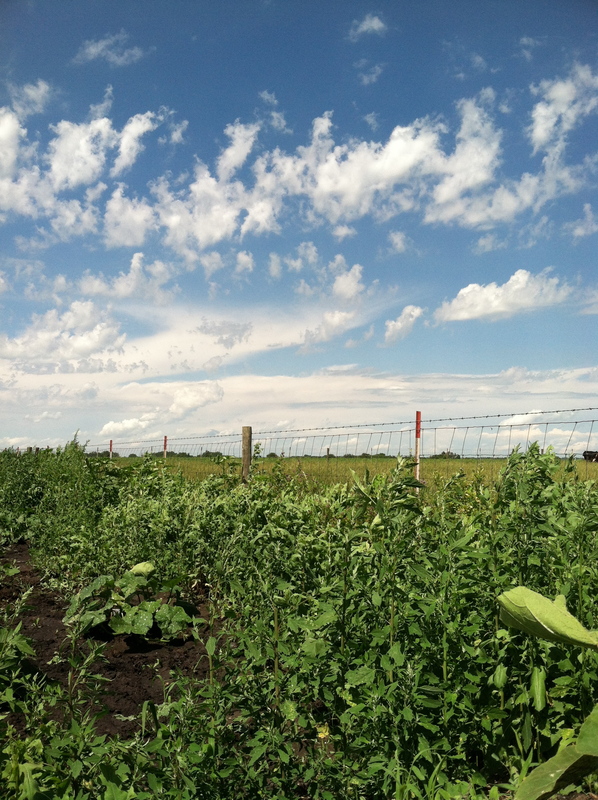 Last week we picked over 12 lbs of green beens! 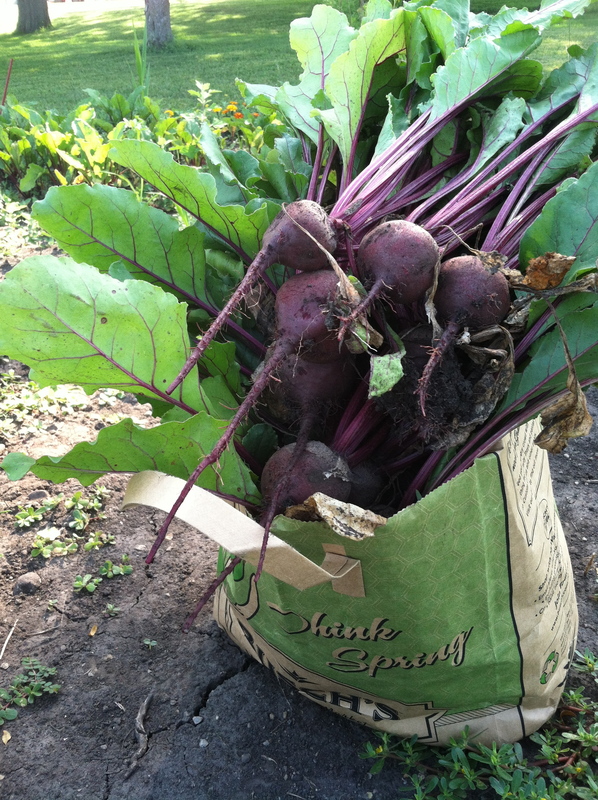 I also pulled up 20 beets and a bunch of peppers, and some young onions. 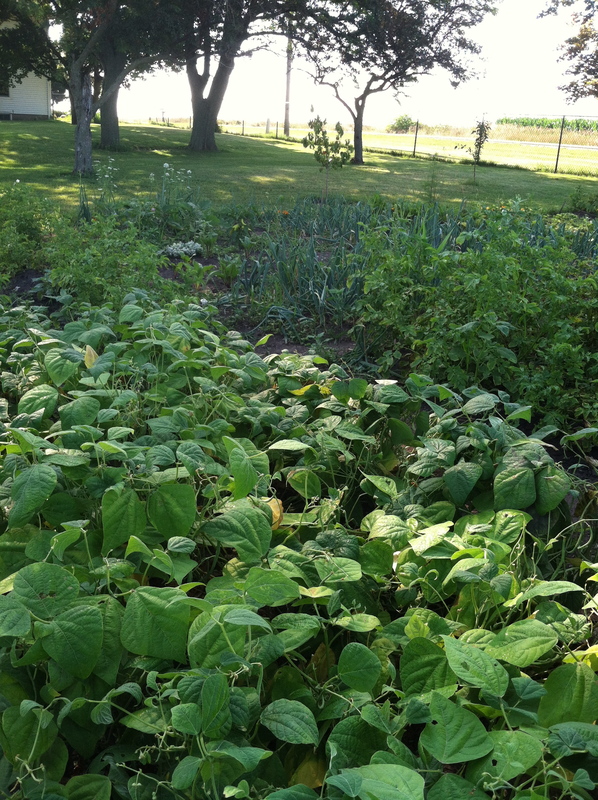 I never get over the excitement of watching something that I planted grow until finally it is ready to harvest and eat. I know it is so cheesy, but seriously, it’s such a miracle. That a tiny seed covered in dirt, with some water and sunlight, will grow and grow some more until it bears fruit. I totally geek out over the miracle of life, whether it’s plants or animals. There is so much new life on the farm, which is really incredible to witness. 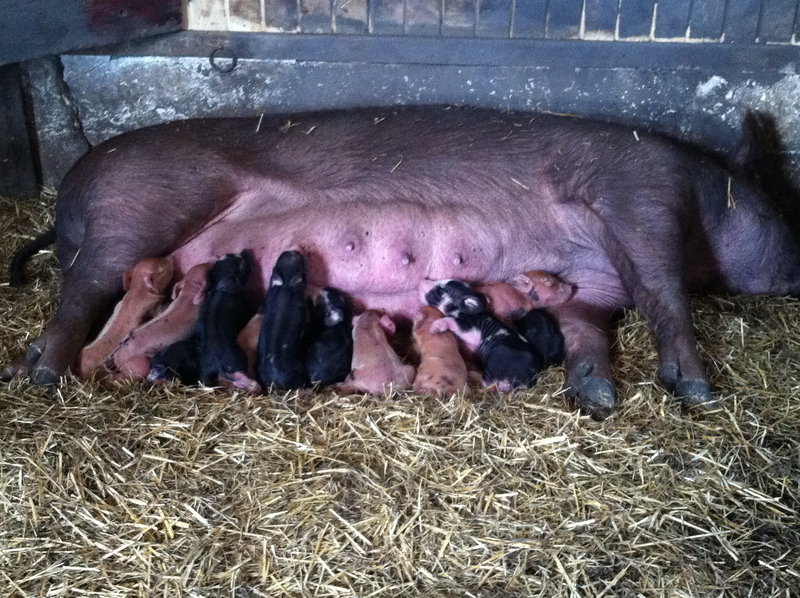 Just last month I was able to watch a sow give birth to a whole lot of babies. 14 sweet babies, born about a month ago! OK, so this goat is the best. 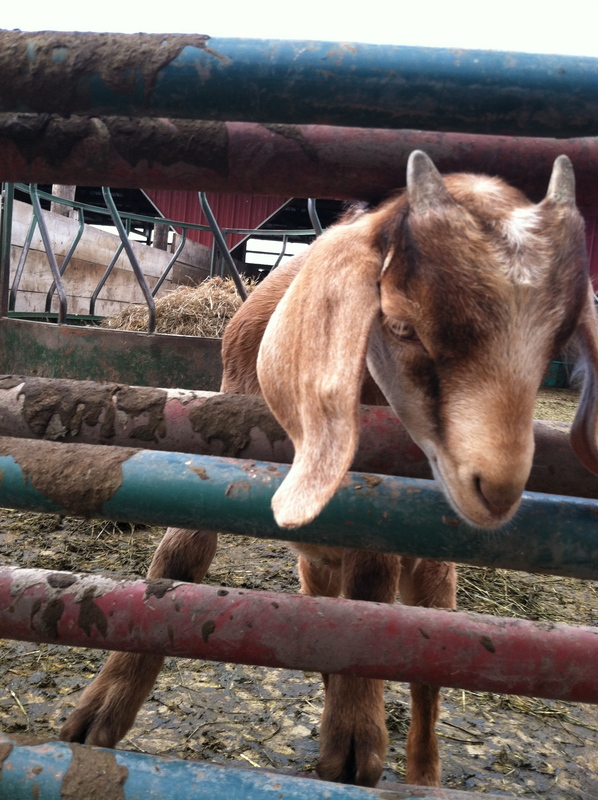 I don’t ever want him to grow up because, let’s face it, adult goats are pretty ugly. But this guy, he’s so sweet. He’s got big floppy ears too big for his head, and he loves getting attention. He’ll frolic (yes, frolic) right over to you with his gangly legs, and he’ll sniff you and lick you and nibble on your fingers, hoping for a treat. I just love him. So many lil guys on the farm. They’re downright adorable. And of course I want to cuddle them all but the goat is the only one who will oblige me. Alright, so, after I’m in the garden and I look at the babies for awhile, willing them to jump into my lap, it’s time for chicken chores. There are two hen houses, or gallineros (I’m learning Spanish, from the farmer’s lovely wife, who is from Nicaragua), and about 1,000 hens. First I head to the big house and I open up the giant sliding doors to let them all out. 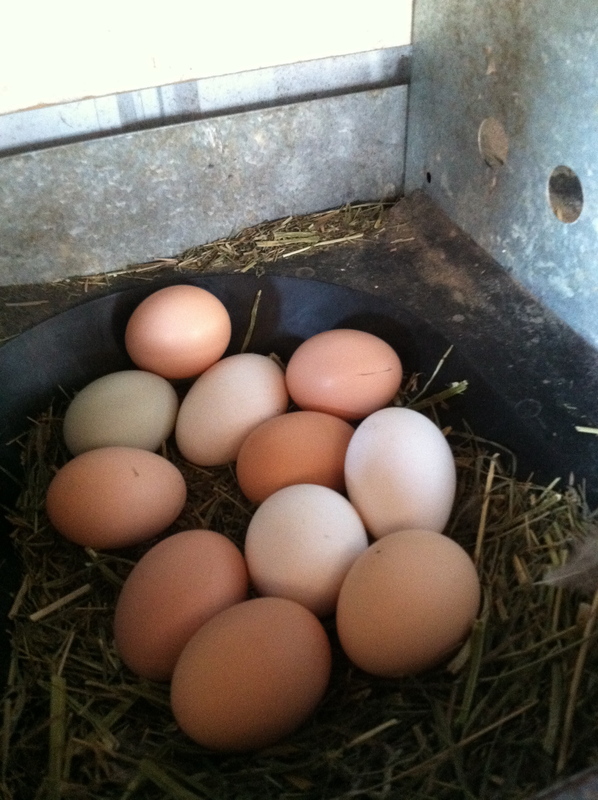 We usually do this around 11 am so that in the morning they can stay in and lay eggs. 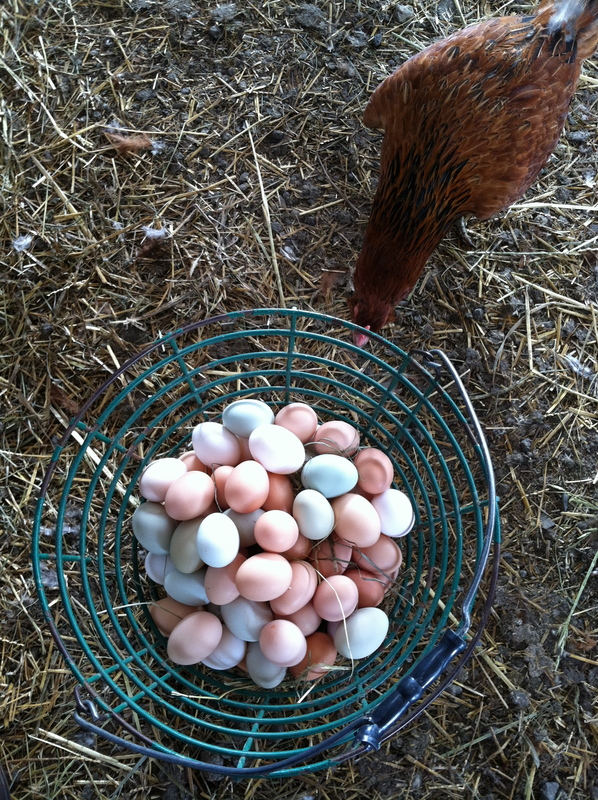 Once I let them out, I pick up my egg basket and start collecting. And this is what I see staring me down from the nest boxes. So, here’s the thing… egg collecting can be a little bit intimidating at first. 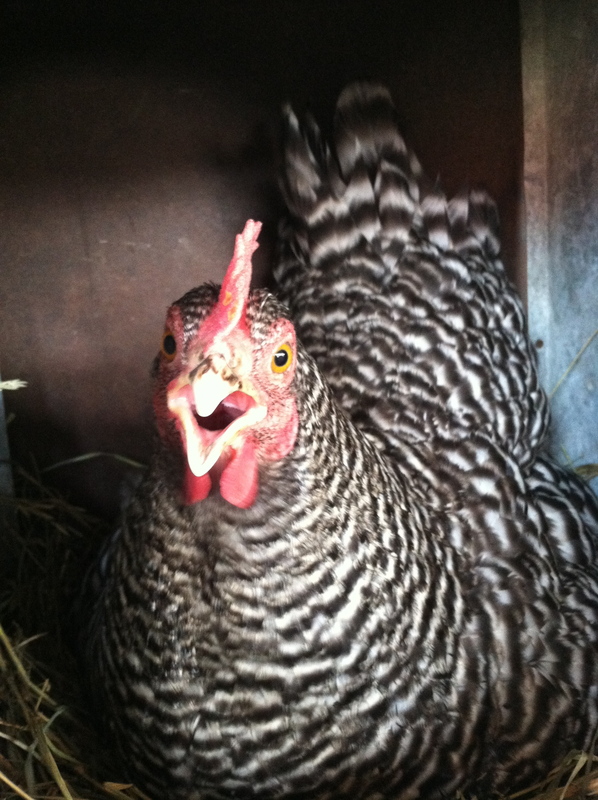 You have these hens squawking and staring at you, and sometimes you can just tell they are not happy with you. 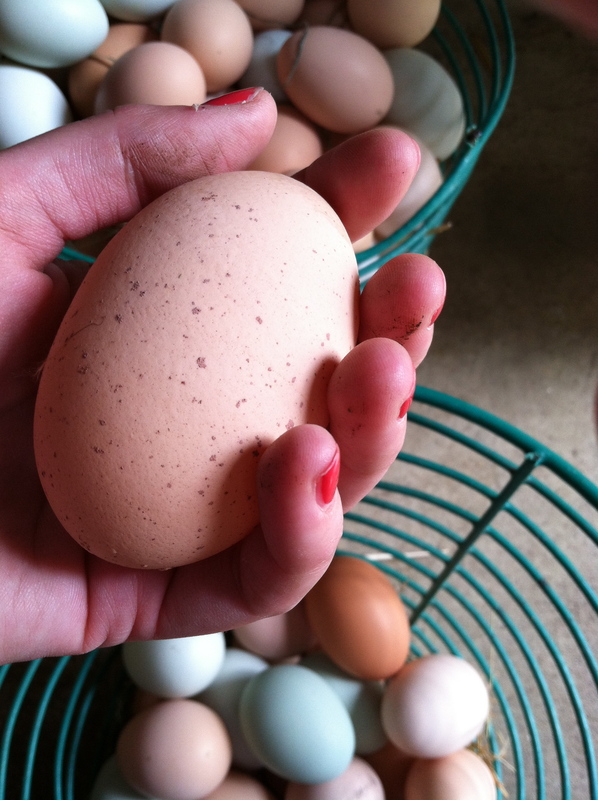 If there is a hen in the nest box, you just have to stick your hand under them (gently, of course) and feel around for any eggs. Chances are they’re sittin’ on a few. I get pecked at a lot, but most of the time it’s not painful at all. Sometimes, though, they will really get you where it hurts — grabbing the skin in their beak and twisting. I suspect these vicious ones are just broody (see below), but yeah, that hurts. Here are the various personalities I’ve encountered while egg collecting. 1. The nonchalant hen. She could care less that you are all up in her business. She’ll even stand up to assist you in the egg collecting process. 2. The paranoid hen. As soon as your hand approaches the nest, she completely freaks out, and runs out of that box as fast as she can, flapping her wings all over the place. You just might get a wing to the face. 3. The broody hen. These are the hormonal ones who just want you to leave them alone so they can hatch a few chicks. They are not at all happy that you’re there. You might find your hand pecked to bits, and you might find yourself shouting obscenities to a barn full of squawking chickens. 4. The cannibal. I can never put my basket down because there are random hens that will follow me around trying to peck at the eggs in there. And in the event that I accidentally drop an egg on the ground, a bunch of the hens will run over like I just rang a dinner bell and go nuts over that broken egg. What the heck? 5. The drama queen. 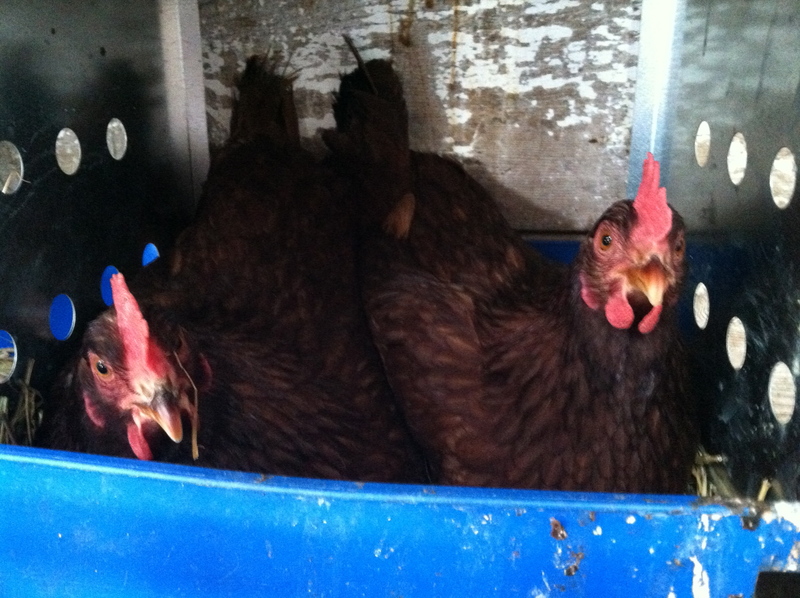 These ladies will scream bloody murder (really, it sounds like screaming) when you take their eggs. They won’t even peck at you, just scream a lot. Sometimes it even sounds like they’re screaming, “no, no, no!” Sorry, girls. 6. The inconsiderate hen. Sometimes I will find two birds in a nest box, which makes it difficult to get under them and get to the eggs. Sometimes I will find two birds in a nest box, and as I’m going to get the eggs, a third will climb in on top of them. And sometimes (OK, one time), I found a hen literally squatting on top of another, as it laid its egg… right on top of her. I find this hilarious. 7. The hoarder. Enough said. 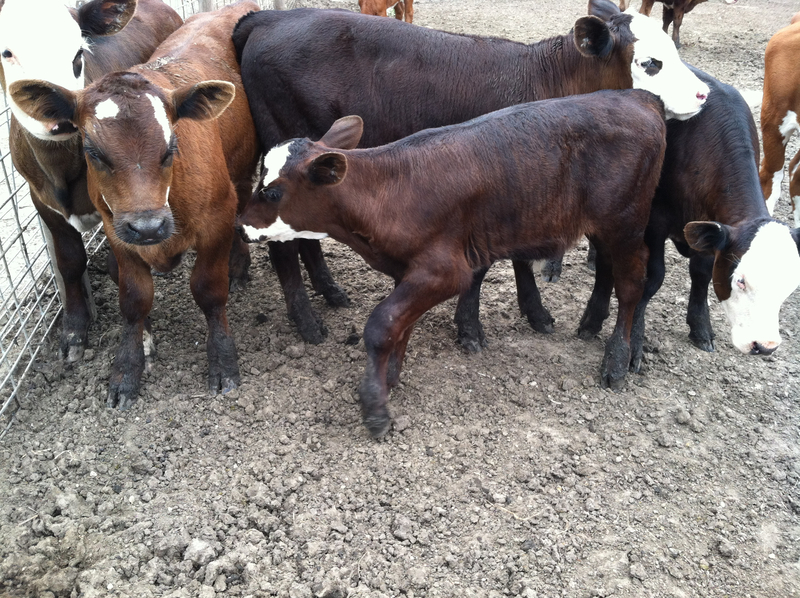 Alright, now that you know the girls, I will introduce you to some other quality animals on the farm. 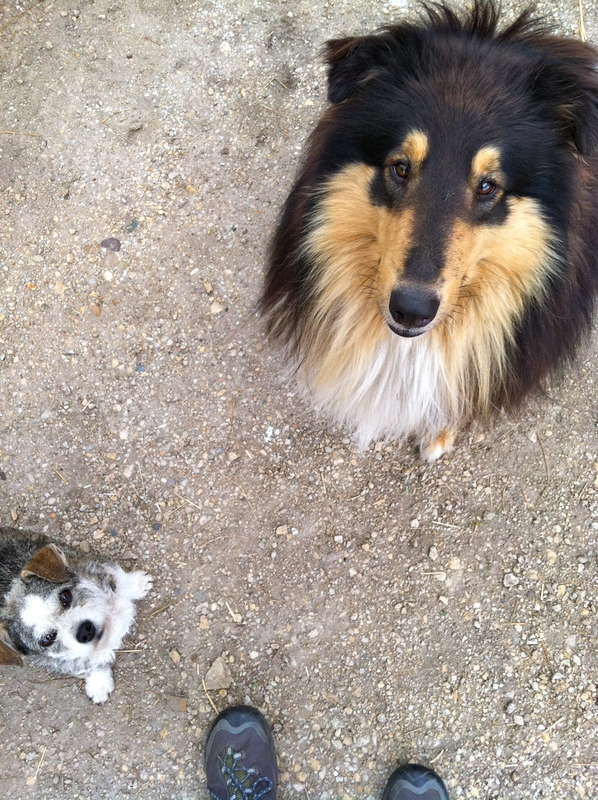 Meet Gabby and Trace, the best farm dogs ever. Little Gabby likes belly rubs, and Trace likes to bark ferociously at strangers but is really a very sweet dog. OK, back to my day. After collecting eggs and refilling water and feed for the chickens in both hen houses, we bring the eggs to the egg washing room where they will later be washed, sorted, and packed. We also refill the sheeps’ water. Here they are snacking on some nice alfalfa hay. Once you toss a bucket of scraps in, they all come running, jumping over one another, trying to get in on this feast and eat every last bit of food. It’s pretty funny. Depending on the day we could be doing a few different things in the afternoon.. we might be washing and packaging eggs, preparing orders, bailing hay, stacking hay bales in the mow (the top of the barn), or more work in the gardens. Umm, I think a dinosaur laid this one? Alright, this post has become exceedingly long, so I’ll cut it short here. 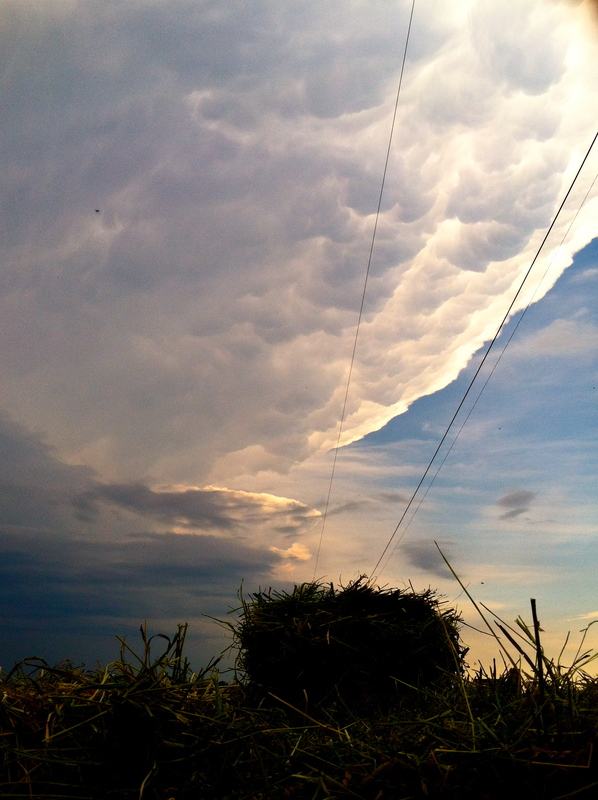 I’ll leave you with some pictures of that beautiful sky I was talking about earlier. Please feel free to ask more questions about the farm in the comments!